Display Monitors on Two Pole Stands are suited for Tradeshow booths and other locations where they are needed at a highee elevation for visiblity. Two people are needed to setup the st5and and the monitors. 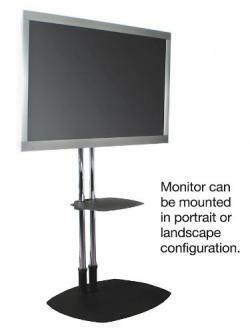 We carry stands that can be used with monitirs displays ranging from 32 Inch to 80" Diagonal TV or plasma monitors.